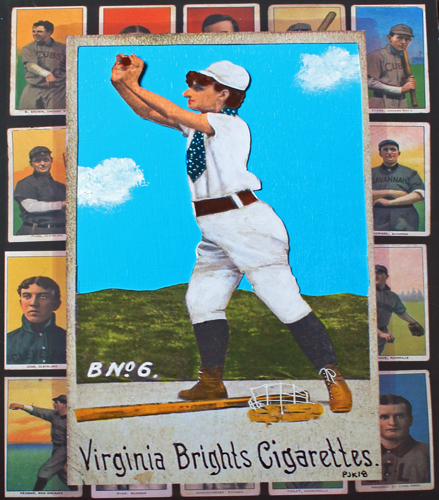 Found b&w baseball card is cut out, colored (pen, ink, photo dyes, marker, acrylics) and collaged with period baseball cards. Then it is mounted on a 10x8 wooden panel. In 1886, Virginia tobacco manufacturer Allen & Ginter created cards to help peddle smokes to their predominantly male smokers. They hired "risque" female models to pose as baseball players in two series of sepia-toned baseball cards.